As the breath of spring begins to intoxicate the air, so ,too, does fertility chime from flowering trees and the newly sung lives of hatchlings. With the birth of nature flourishing under the lingering sun, the stage is appropriately set for Mother’s Day, a celebration not only of motherhood, but of life itself – perhaps the ultimate creative expression known to humans. In preparation for this day, we search for subtle ways to make our mothers feel special, and the tokens of our appreciation memorable. Often, this may be done through thoughtful presentation. But choosing quality materials needn’t entail wrapping your gift in lavish silks or cluttering them with gaudy embellishments. Contrarily, you may find it more tactful to employ the unrivaled charm of nature. Such natural elements can manifest in the form of accents, or used on their own to envelope a gift with whimsy. 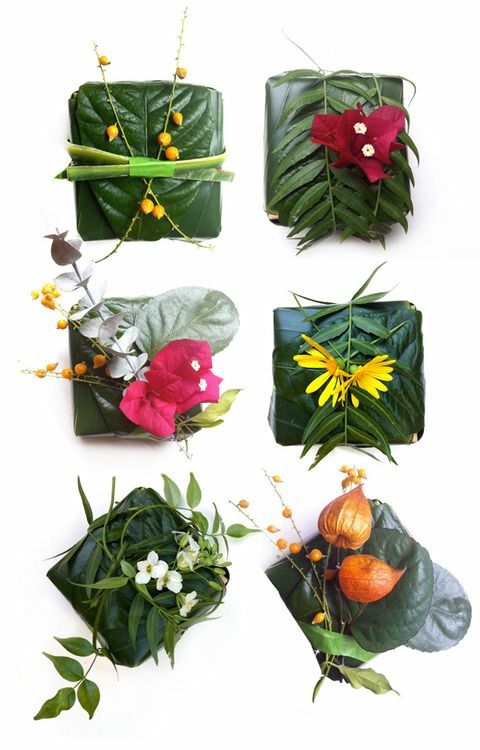 As seen above, you can wrap your gift in foliage using resilient leaves of generous proportions. The leaves can be held in place with the use of green tape, and adorned with an assortment of pods and flowers. If a more conventional appearance is sought, gifts can be bound in bio-degradable materials of human design, including brown paper and burlap, known also as messian cloth. Of course, there is little limit to the amount of materials that would be suitable for reuse. This leaves plenty of room to be creative, and incorporate what resources surround you. Newspaper, sheet music, old calendars and old maps can all be used in place of traditional wrapping paper, and will undoubtedly add character to presents. To better illustrate this point, below is the understated elegance that can be achieved with limited resources and a little ingenuity. Wrapping materials can be held in place with the help of non-toxic adhesives or tape. 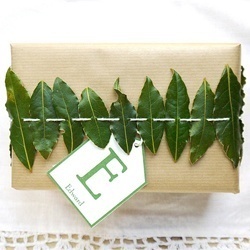 Additionally, you may choose to fasten packages with twine or “ribbons” made from fern foliage and other leaves. Depending on the style in which you wrap, you can accent your package by tucking pressed or fresh flowers into the “folds” of material, allowing their fragrance to conjure pleasant thoughts and memories. Old photos and handwritten letters also serve as sentimental inserts.